I absolutely adore Fairytale re-tellings. Sometimes there is nothing better than curling up and visiting an old, favourite tale with a new spin. This book was wonderful in so many different ways. Firstly, it was hilarious! The author's little interruptions throughout the story was a perfect touch. I couldn't help but imagine a British story teller living in a cottage, reading these stories and bringing them to life. The authors ability to make these tales come alive in such a unique and edgy way was so charming. Secondly, the spin on old classics. I am familiar with the grimm versions and the children versions of most fairy tales. There is now a great new category; The Adam Gitwitz version. He took each story and each character and gave them a little umph. He packaged the novel with a beautiful writing style that flowed so perfectly. I haven't read A Tale Dark and Grimm yet, but it won't be long before I do. I adored the author's presentation and twist on these classic tales. In A Glass Grimmly is perfect for those nights when all you want to do is curl up and indulge in a book. You will get lost with these mystical creatures and characters. 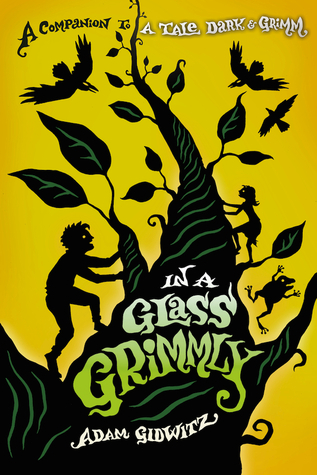 In a Glass Grimmly is definitely a novel you don't want to miss out on! I want to read this so badly! I've heard from a couple other ppl that they liked this one better than the first too. :) Great review!